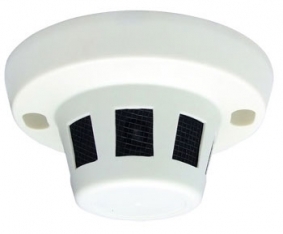 High resolution hidden smoke detector camera for use indoors to capture good facial detail. There is a small mini cctv camera hidden behind the smoke detector casing, looking from the side at an angle. This hidden cam is meant to be mounted on a ceiling at least 7ft high so you can get a good view of passersby. The camera has a high resolution 1/3" SONY Color CCD sensor which allows great quality video to a CCTV analog DVR. The camera has a lux rating of 0.5 lux and we recommend using it with a minimum of a 20 watt light bulb. Be sure to purchase siamese cable to run power and video to the camera. Be sure to purchase a power supply and cable if you don't already have it.